Large inequalities of income in a society have often been regarded as divisive and corrosive, and it is common knowledge that in rich societies the poor have shorter lives and suffer more from almost every social problem. This groundbreaking book, based on thirty years' research, demonstrates that more unequal societies are bad for almost everyone within them - the well-off as well as the poor. The remarkable data the book lays out and the measures it uses are like a spirit level which we can hold up to compare the conditions of different societies. The differences revealed, even between rich market democracies, are striking.Almost every modern social and environmental problem - ill-health, lack of community life, violence, drugs, obesity, mental illness, long working hours, big prison populations - is more likely to occur in a less equal society. The book goes to the heart of the apparent contrast between the material success and social failings of many modern societies. 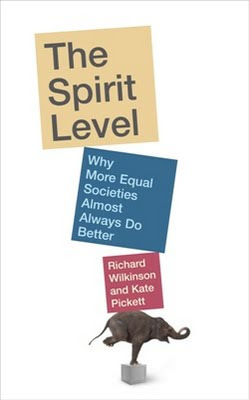 "The Spirit Level" does not simply provide a key to diagnosing our ills. It tells us how to shift the balance from self-interested 'consumerism' to a friendlier and more collaborative society. It shows a way out of the social and environmental problems which beset us and opens up a major new approach to improving the real quality of life, not just for the poor but for everyone. It is, in its conclusion, an optimistic book, which should revitalise politics and provide a new way of thinking about how we organise human communities. Richard Wilkinson has played a formative role in international research and his work has been published in 10 languages. He studied economic history at the London School of Economics before training in epidemiology and is Professor Emeritus at the University of Nottingham Medical School and Honorary Professor at University College London. Kate Pickett is a Senior Lecturer at the University of York and a National Institute for Health Research Career Scientist. She studied physical anthropology at Cambridge, nutritional sciences at Cornell and epidemiology at Berkeley before spending four years as an Assistant Professor at the University of Chicago. Brilliant book and he is a fascinating speaker. Unfortunately not heard Kate Pickett. Heard Wilkinson at LEAP conference and TUC Social Forum on welfare reform.